The first session we were only dancers and musicians and no other animals. We have been diving in to different kind of focusses how you can relate and interact with another improviser. We defined areas like space, time, speed, power/energy. Talking about those definitions made us even more aware about the difference of capability of using those areas and interpretation for a dancer or musician. To define those areas more we first worked in duo’s leading and following each other. From there every duo was designing and playing rules within the context of the specific area. When you do this, I do that….Etc etc. After every focus of area we had a short discussion about what did work and what didn’t. 1. Space: For a dancer we talked about big versus small. And on the spot versus in the space. But also a small body-part versus whole body. For some musicians a big move is creating a very different sound then a small move. For example for the double-bass. Through this the musician could relate to the dancer using the same definition and relation towards the space. But if we see a small movement affecting the space and a big movement affecting the space, we could compare this spacial effect maybe more with the volume of the sound. When you hear a very loud sound you experience it as the space being filled with lots of sound, and a soft sound stays more with the musician on the spot. Very loud would mean a big movement in space and very soft would mean a small movement on the spot. 2. Speed: The follower is following the speed of the leader. a. Every person can have a slightly different interpretation of the rule. For example when becomes a movement so big that it isn’t small anymore? This confusion can be interesting, it gives you more space to stretch the rule. But it can also make the rule less ‘sharp’. To make a rule more sharp you can define the rule more. For example; When the dancer moves on the floor, the musician repeats his or her sound. For the musician here it means having space again. Because how long is the musical phrase that you repeat? If you wanna make the rule even more strict, you could say; When the dancer moves on the ground the musician repeats 8 counts of the sound he/she was playing. b. When we are practicing certain strict rules it can make us as improvisers ‘narrow-minded’. We are only busy with the rule and we forget about all the other possibilities we still have. It can make our work less play-full and more flat/2-dimensional. While you are experimenting with the rules it is good to keep your awareness of the others, the space, your body using all of your senses. It is good to keep on playing. When the rule only covers a certain spacial code. You still have all freedom to play with rhythm, emotion, other improvisers etc etc. c. We were wondering if there are also rules which are not having the ‘If-then-form’ For example: ‘If the dancer is touching another dancer with her/his hands, all improvisers do a kakafonie (chaos).’ We could design a rule of interaction which stays the whole improvisation. For example the drummers’ cymbal is following the rhythm of the knees of the dancer’. This is a very different rule. Maybe we can find other rules which are not in the ‘If-then-form’? d. Some rules can make the dynamics of the improvisation very exciting. When the double-bass plays a very high sound, all improvisers go in to ‘chaos’. And when the sound is finished everybody goes back to where they came from. e. We were also having games which were related to the senses, for example the eyes. When you looked in to someones eyes you had to connect to this person, and go in to the same ‘thing’. Maybe we can explore the senses more in designing new rules? After the work in duo’s we did a group-instant-composition were we had one group-leader who could design the rules of interaction for the group. We were naming that it was even more important now that the improvisers stayed open and playful. Using the rules more to compose then as an exercise. It was wonderful to see how those rules were affecting the instant composition. They were opening the awareness of the group, creating internal relations between the improvisers, letting similar things come back in a different way. -explore more areas such as atmosphere/colour. circular: When A does 1>B does 2. And when B does 2> C does 3.
and I will think about more! Maybe we can also make rules which are influenced from outside. When one of the audience-members is touching his/her face all improvisers go as close as possible together, keeping on doing what they were doing. Looking forward to see you all thursdays! I could stay longer until 17u if we are inspired to continue longer. Dancer Maaike v.d. Westeringh is preparing an exchange project between European and Ugandan dancers and musicians. She is working in a collective that was formed out of the first project in Uganda called ‘Nasibu’. Click here if you wanna know more about Nasibu. In preparation of this dance-music-project which will happen in 2014 she would like to investigate some simple games. Together with you, dancers, musicians and other artists she wants to play with some clear rules which are influencing the relation, sound-movement-space. We will start with one rule, finally building a game with more complex rules which will bring us out of our comfort-zone. She is interested in creating a strong interdisciplinary world where everybody influences everybody, in an endless amount of possibilities and where everybody is leader and follower at the same time. We will work thursday the 13th and 20th of June from 13-15.30. Please be ready to go at 13u, because Maaike has to leave at 15.30 sharp. For location-details click the link below. Starting this thursday: 3 new sessions called ‘Pathways in sound and movement’. Tow years a go I studied with David Zambrano focussing on his groupimprov-technique called ‘passing through’. 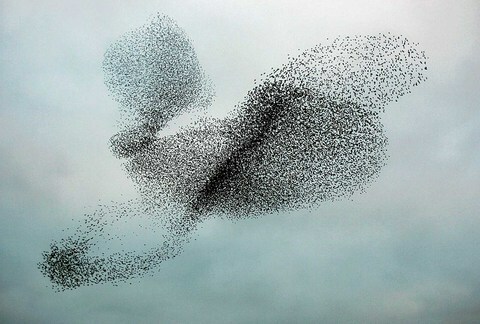 In ‘passing through’ we recognize figures from nature, such as a group of starlings flying in the air. They create organic formations and dynamics composed of many individual birds, becoming one large body with its own pathway.